The careful planning of one's estate requires the preparation of an inventory, an honest valuation, a plan for distribution, and selection of an administrator. Inventory — Keeping your material organized will insure that it can be easily inspected and the better items identified. That is why one of the most important documents is an inventory of your collection. Don't panic, this does not necessarily have to be a complete list of stamps and other items — but it should include different collections or exhibits, number of albums and title of their contents, the nature of loose stamps, literature, etc. The list should also identify the location of the items (book case in stamp room, bank vault, etc.) and if any items have expert certificates. Honest Evaluation — A common mistake is that the collector has not shared an honest evaluation with anyone else. We hear far too many horror stories about collections for which the value was hidden from other family members who, not realizing the collection represented significant value, simply pitched it. And it is also not uncommon to hear about the crestfallen spouse who believes the collection of modern U.S. first day covers is worth $50,000. If you don't want the value of your collection known while you are alive, at least provide a reasonable estimate in the documents you leave behind to be opened after your death. In making an inventory, list catalogue value, replacement value, and estimated price that might be realized at a forced sale. Do I want to pass my collection on to others? Do I want portions that may not have much value used to promote stamp collecting to kids? Have I promised any item(s) to a fellow collector? Do I want my family members to benefit financially from the sale of my collection? Whatever your designated wishes, it is important to provide precise written instructions. It is also beneficial to provide a list of any dealers or auction houses that you wish to be used or that are familiar with dealing with similar material. Also indicate any friends who know the material and might be willing or have agreed to help prepare your material for sale. Remember, your heirs may get swamped with alleged promises, so protect them by providing a written record of any designations and relevant contact information that can be easily found and shared with your administrator. 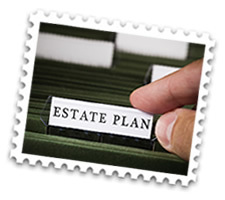 Select an Administrator — Many individuals designate a family member as executor for their estate, but if your family has little philatelic knowledge you may be better off choosing a trusted friend who understands your collection. Precise instructions on specific items may prove difficult to implement without a basic knowledge of stamp collecting. There is nothing that prevents you from designating a "sub-executor" for your philatelic collection who is different than the main executor. If you do not have anyone you feel comfortable with appointing as your philatelic administrator, you may refer your heirs to the APS Estate Advisory Service and provide details of how we can be reached. Estate Advisory Labels — Self-stick identification labels are available free to APS members who want their heirs to use the APS Estate Advisory Service — Call 814-933-3803 ext. 201.